Third Times the Charm or Strike Three? So I’m headed down to DC to testify once again before a Congressional Committee. This will be the third time I’ve gone to The Hill to discuss the widening skills gap, the student loan crisis, the disappearance of vocational education from our high schools, and the pressing need for some sort of concerted effort to challenge the prevailing definition of a “good job” here in modern society. Perhaps three times will be the charm? Or perhaps it’ll be strike three? Stay tuned. I’ll get back to you. In the meantime, many of you have asked if I’ve been in touch with the administration about this or that. The short answer is no. Aside from auctioning off one of his autographed bathrobes for the benefit of my foundation, ($16,500!!! ), I’ve had no contact with our President. However, I did promise to offer my foundation’s services, should he or his people wish to support our on-going campaign to shine a light on 5.6 million jobs that no one seems terrible excited about pursuing. Toward that end, I sat down this morning to write a similar letter to the one I sent his predecessor, eight years ago. 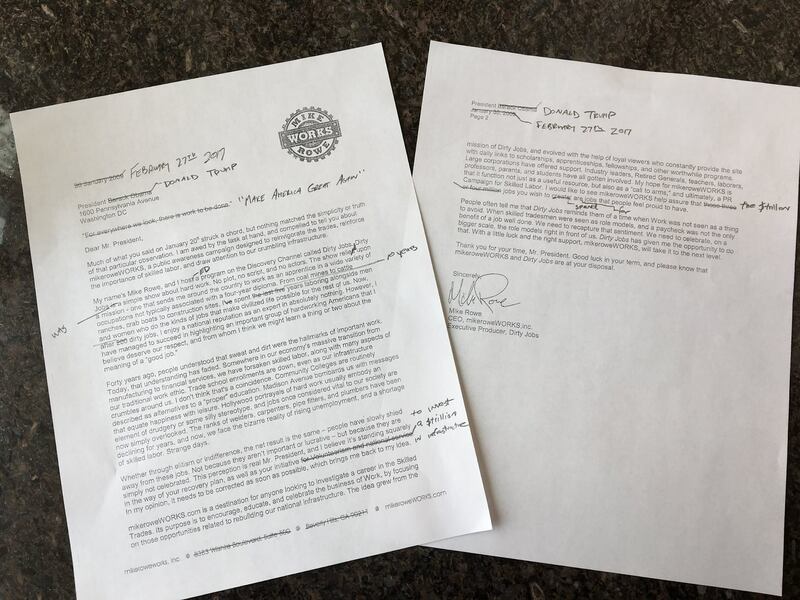 Funny thing – after reading what I mailed to President Obama, I realized not much has changed with respect to the skills gap – except for the fact it’s doubled in size. So rather than re-write the letter, I just marked up the old and posted it here. Hey – he’s busy. I’m busy. And if anyone can appreciate the expediency of a rough draft in social media, it’s gotta be a man who’s unafraid to tweet without a net. Obviously, it’s longer than 140 characters, but I’m betting he’s got people who can read this to him.